Russia employs a special representative to Africa, Mikhail Margelov (rear window), whose best known statement of the policy he represents is: “Russia has returned to Africa, and Africa to Russia.” Margelov doesn’t answer questions about what this means. He was scarcely more explicit when he was the Russian negotiator for Muammar Qaddafi’s exit from Libya – “the most delicate topic” he called it in June 2011. Four months later Qaddafi was shot dead trying to escape. Libya had been the largest debtor in Africa owing money to Russia; in 2008 then Prime Minister Vladimir Putin (centre window, right) announced that Russia was writing off $4.5 billion, all of the debt accepted by both sides, on condition that the Libyans agreed to offset the write-off with contracts to buy arms, railways, power plants, and gas production ventures worth roughly twice that amount. At that point, and still, the largest debtor to Russia remaining in Africa was the Republic of Congo-Brazzaville. By 2010, the Club of Paris, representing creditor states which include Russia, had announced it was relieving a total of $2.4 billion of the Congo’s debts, promising additional “debt relief to 100% on a bilateral basis.” The small print of the Paris Club announcement confirms Russia’s participation in the agreement, but leaves imprecise how much of the Congo’s debts would be cancelled, how much rescheduled, and how much would be swapped for assets and promissory notes. French sources estimate that at the end of the Soviet Union in 1990, Congo-Brazzaville owed Moscow at least $250 million, principally for arms deliveries. Over the twenty-two year interval since then, with compound interest it is likely the Congolese obligation has grown to between $500 million and $600 million. Claims the debt is twice that size have also been reported. There have been few Russian commercial interests or investments in the Congo, and so there is nothing like the asset or contract value available which the Kremlin could agree to swap for debt relief, as it has done with Libya. In May of 2010, Severstal, the steelmaker owned by Alexei Mordashov, bought a 16.5% stake in Core Mining, a British Virgin Islands company, which has been exploring for iron-ore at the Avima deposit in the northwest corner of the Congo. 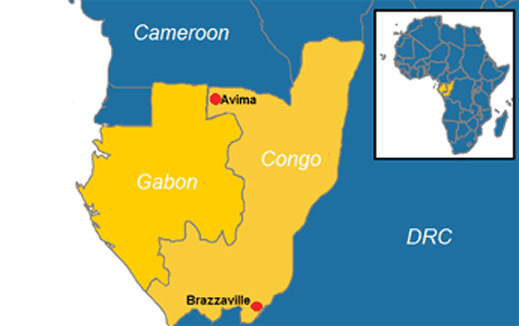 Avima reportedly holds 690 million tonnes of reserves with mineralization of up to 58% Fe. In its May 2010, share purchase announcement, Core Mining said Severstal would spent $55 million for its stake and to finance exploration over two years through 2012. This month, Core announced that it has received a full mining licence for Avima, but production is not expected before 2016. Severstal’s participation in the Avima project is dwarfed by Glencore which has bought the rights to trade all the iron-ore to be mined. On March 4, 2012, a fire and series of explosions destroyed a central arms and ammunition depot in the centre of Brazzaville, killing about 300 people, wounding many more, destroying the homes of thousands, and eliminating a large part of the Congolese Army’s stock of armored vehicles and ammunition. The Congolese government has proposed spending about $680 million for reconstruction and welfare. President Dmitry Medvedev sent his condolences. Eight months later, Sassou Nguesso arrived in at the Kremlin to ask for help. There was a brief announcement on the day of his meeting with Putin. This was followed by a communique from the federal Ministry of Energy, announcing that it had signed a memorandum of understanding with the Congolese Ministry of Regional Planning and Capital Construction for an oil pipeline to be built from Pointe Noire, on the Atlantic coast, through Brazzaville, to Oyo, in the centre of the country. The distance to be covered is about 900 kilometres. The communique says that Stroitransgaz (STG) is “ready to implement the design, construction and commissioning of this major infrastructure project in the Congo.” Timchenko is the controlling shareholder of STG. Since November an STG spokesman says nothing has happened. The Congolese Embassy in Moscow says it cannot add any detail. Whether the next session of the Russian-Congolese government commission will move the project off the drawing board isn’t known any more than the date on which the commission is likely to meet later this year. More promising, however, is the resumption of the old arms relationship with Brazzaville. Ahead of Sassou Nguesso’s visit, a delegation of Congolese police and interior ministry officers visited the Military-Industrial Company (VPK) at Arzamas, Nizhny Novgorod. 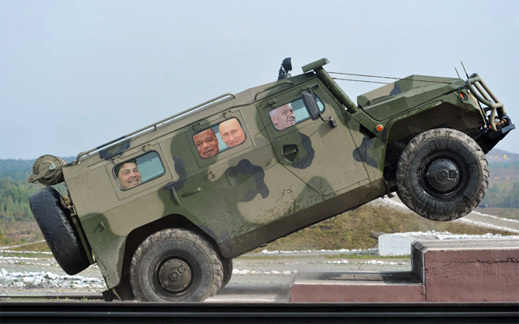 A release from VPK reported they were keen on the BTR-80 armoured personnel carrier, the SPM-3 Bear, a heavy-machine gun mounted police vehicle, and the Tiger, another type of armoured police jeep (see image). Sergei Suvorov, a spokesman for VPK, confirms that at least two batches of Tigers have been contracted for by the Congolese police and ministry of interior, but he declines to name the contract value. VPK is owned by Oleg Deripaska through the Basic Element holding company. French and central African sources close to developments in Brazzaville say the resumption of arms deliveries is a priority for Sassou Nguesso to handle growing civil unrest since the March 2012 disaster, particularly since France’s President Francois Hollande has been reluctant to endorse Sassou Nguesso personally, or strengthen his hand domestically. Were Sassou Nguesso to retaliate and offer new deals with Russian oil companies like Rosneft, Gazpromneft, and Gunvor, in preference to France’s Total, the Kremlin has at least half a billion dollars of official debt to sweeten the pot.